The HUI is a good proxy for the gold miners. Usually the HUI is outperforming the rest of the gold miners Indices ( XAU, GDM , GOX). Miners which are components of this index tend to have little gold hedge or none, thus providing investors with the full opportunity to enjoy this roaring global gold bull market. Technically, as noted at my last update, the HUI completed ABC correction wave (wave II – 3), followed by minor up wave ( i- III) and then a minor wave down ( ii – III). Currently The HUI is at the beginning of wave (iii – III) which is part of a larger degree third wave up – This is a triple three wave up and as such it encapsulate a potential for extremely large gains on the upside. This is the time you want to be fully long all good quality things gold and don’t be quick to take profit. 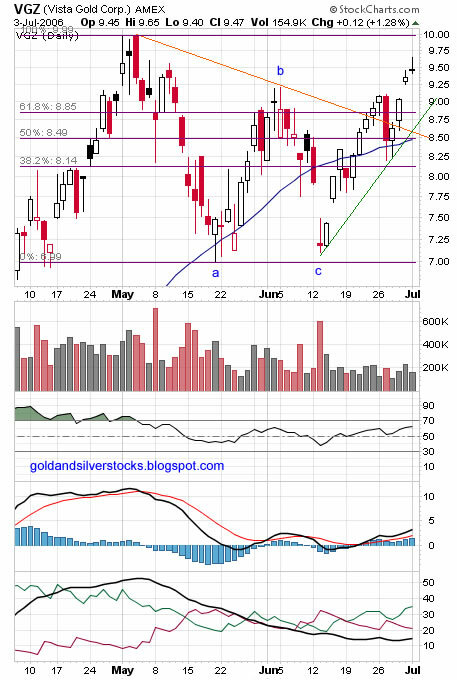 Below is HUI daily chart annotated with 2 sets of Fibonacci retracement lines, pink set from top ( I – 3) to bottom (c- II) and purple set from bottom ( c- II) to minor top (i – III) the HUI is just above the 38.2% on both sets and the 50 DMA – this should provide good support. 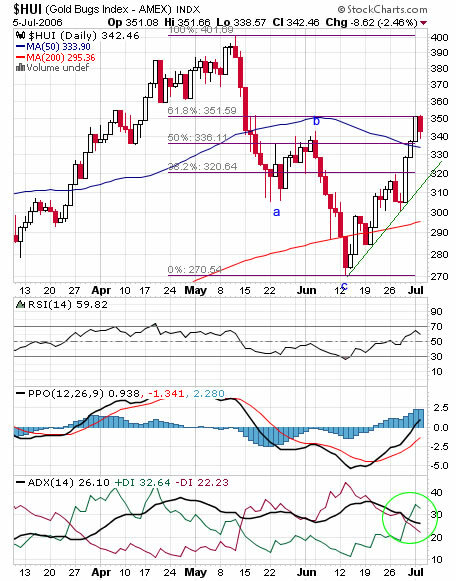 RSI above 50 , MACD flat above zero. 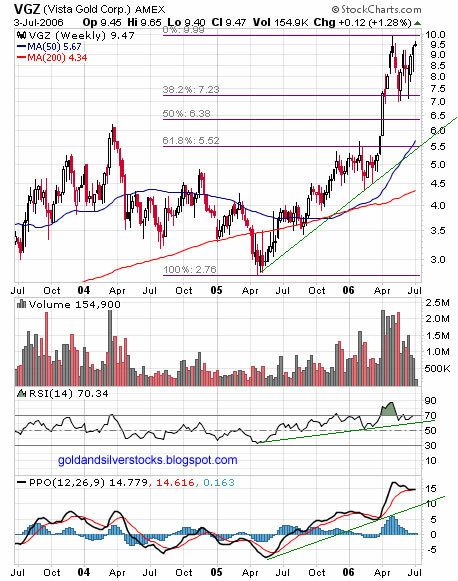 I repeat, this is the time to be fully long on gold and all of your favorite gold stocks as the potential for massive gains is extremely high in my opinion. 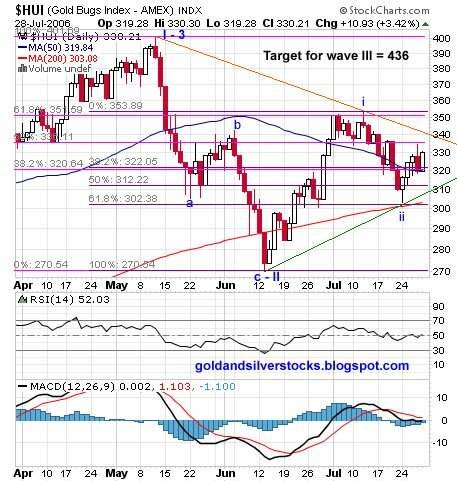 Same analysis for both charts, following the completion of A-B-C correction (wave 2) both the HUI and the Goldminer ETF (GDX) have just completed minor wave up (i) , minor wave (ii) is underway and should be terminated at one of the Fibonacci lines below current price. RSI trending down below 50 , PPO natural. 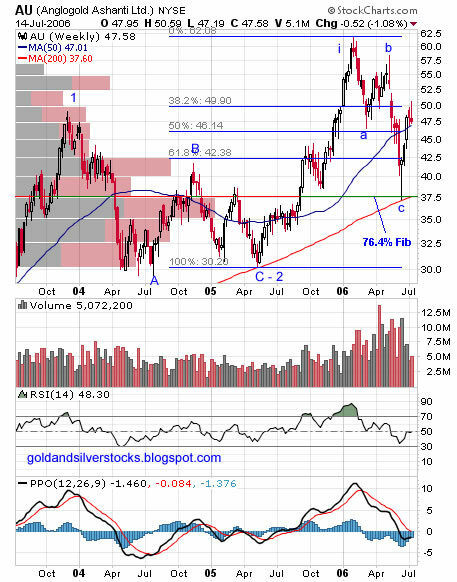 Support at Fib lines and 200 DMA. Once the minor correction wave (ii) is over, expect a minor yet extended wave (iii) which will probably take both GDX and HUI higher to retest the all time highs. Remember - all is subject to the price of gold (POG) - see my latest gold price analysis. Ivanhoe Mines is a Canadian mining - exploration company with operations focused in the Asia Pacific region. Ivanhoe's core assets are its Oyu Tolgoi Project and the Nariin Sukhait Coal Project in southern Mongolia. Other operations include copper and gold exploration and projects in Mongolia , Myanmar, Kazakhstan and Australia. See : www.ivanhoe-mines.com for more details. Respectable fellow blogger Bill Cara mentioned IVN several times. The stock was trading as high as 19$ (CAD)at Q1 1997 and as Low as 0.55$ at Q4 2000. 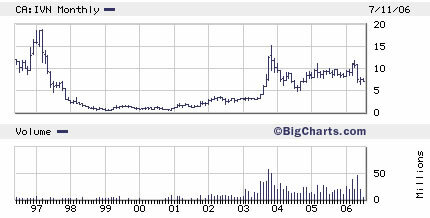 2003 was the best year for IVN investors – the stock had spectacular rally and topped at 15.30$. Since then the price performance was poor to say the least, while Copper and Gold are up sharply. The chart pattern is disordered indicating high risk, from pure technical perspective It belongs to the group of DROOY and KRY. 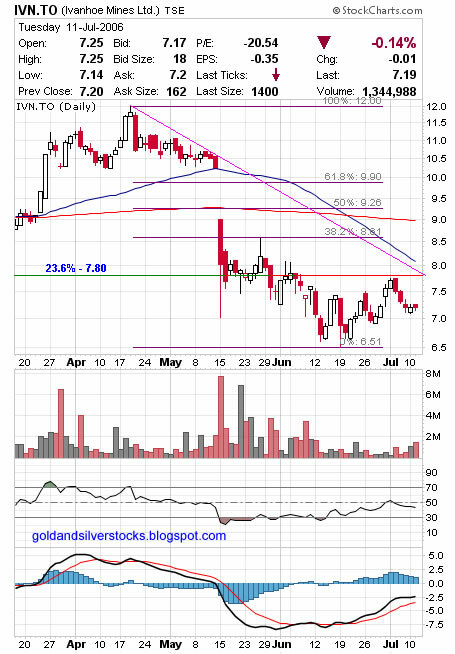 Price action – from 4.85$ to 12$ then it crashed through the 50 weeks moving average with a huge gap - and bottomed just 3 cents below the 76.4% Fibonacci level..
Indicators- RSI trending down below 50, PPO bearish crossover. 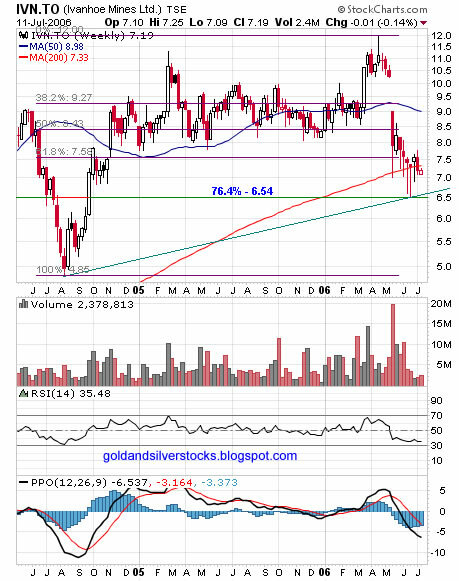 Support – the green trend line and the 76.4% Fib(6.54$). Resistance – the 200 WMA , the Fibs especially the 50% Fib area. Again, huge gap > 1$ through the 200 DMA, relatively mild bounce to the 23.6% Fib line . 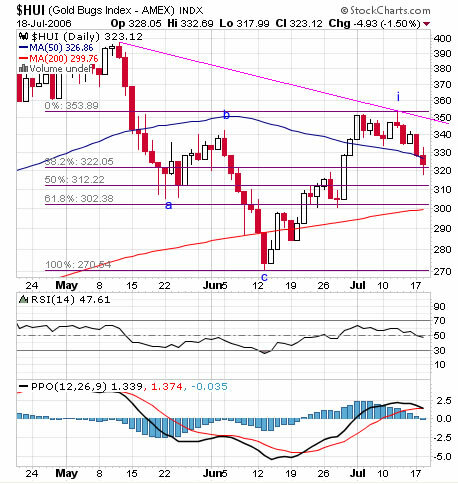 Indicators – RSI trending down below 50, PPO bullish crossover but still below zero, PPO histogram positive. 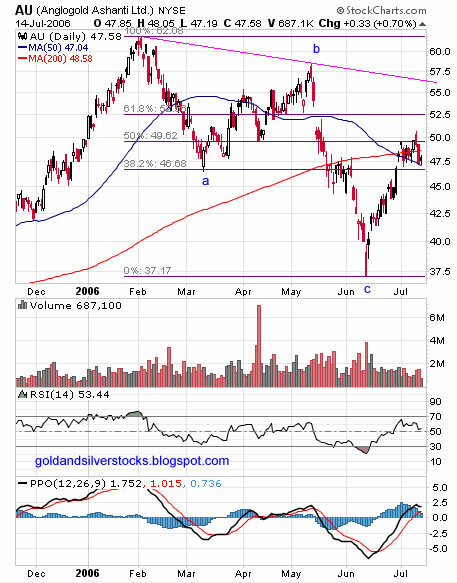 Heavy resistance at Fib lines and 50 MA, breaking above the pink downtrend resistance will be bullish and might ignite a rally. 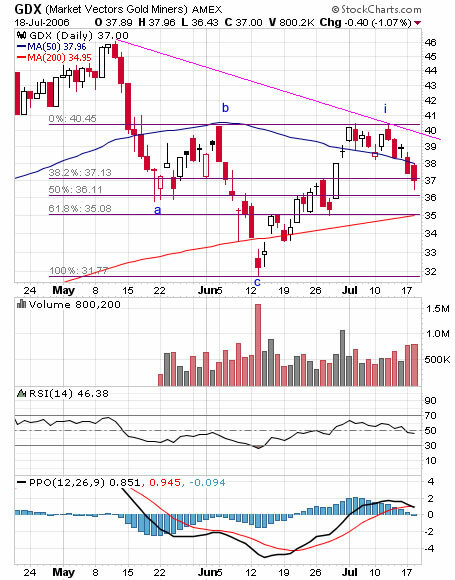 The HUI bottomed at 270.54 after a typical ABC correction then rallied to the 61.8% FIB, currently still above the 50 daily moving average, RSI trending up above 50, PPO bullish crossover, PPO histogram positive, ADX bullish crossover. Given the quick recovery and some resistance at the 61.8% FIB we might see a bit of a consolidation at current level with good support at green uptrend line, 50 DMA, 200 DMA and the 38.2% FIB line. The HUI will be affected from both the price of gold and the general stock market. Use any weakness to accumulate your favorites gold and silver stocks.